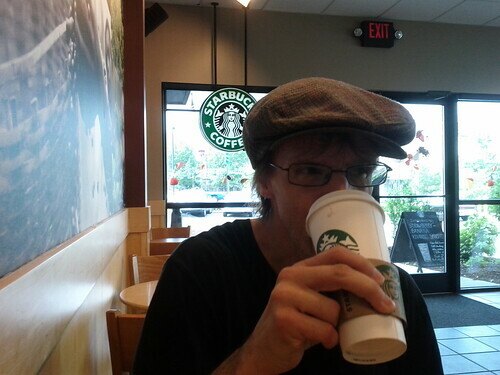 For the first time, Bruce and I went to the Worcester Starbucks at 11 East Central Street. Mike: What do you think about life? Bruce: Sometimes it can be pretty tough. M: What do you think about Starbucks? B: The coffee is strong. This week, we talk about the downtown Honey Dew Donuts, and the end of Java Hut. 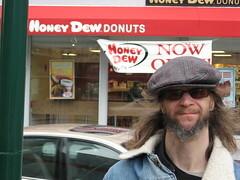 Bruce: I’m Bruce Russell, aka The Snow Ghost, and we’re doing a coffee interview about the new Honey Dew Donuts, formerly a Dunkin Donuts. And my experience was that it’s not like the other Honey Dew Donuts. It’s a small place as opposed to the other ones I’ve gone to. This one wasn’t as busy. Pie and Coffee: Well, we went there on a Saturday morning. I have to say, I thought it was a pretty comparable experience to Dunkin Donuts, except that I got a positive vibe from the staff. 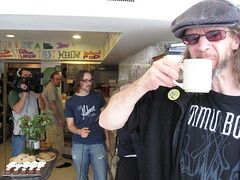 This week Bruce and I grabbed some free coffee at the Artichoke food co-op, 800 Main Street, Worcester, MA. PIEANDCOFFEE: It’s time for the hammer of judgement to smite the co-op. BRUCE: This episode . . . gonna introduce this episode, it’s called Pie and Coffee. And we’re here to interview about the Artichoke and the experience that went on there yesterday. PIE: So they had free coffee yesterday. PIE: They usually don’t have pre-made coffee. I think they just have the beans. 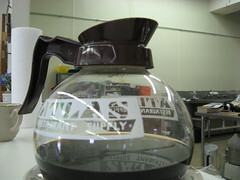 What did you think of the coffee? BRUCE: It was very good, but it was very strong. PIE: You don’t like it so strong? BRUCE: I love it strong. 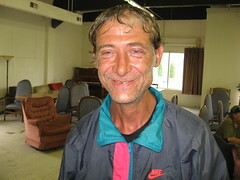 Are you able to help the South Bend Catholic Worker with a donation? I think they could also use a copy of the Joy of Cooking. You can bring donations to their drop-in center, “Our Lady of the Road,” 744 South Main Street in South Bend, Indiana, Friday and Saturday mornings. If you’d like to volunteer at Our Lady of the Road, please stop by and say hello. 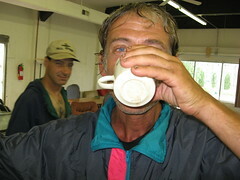 Your generous donation will keep Al fully caffeinated. Bruce and I talked to Brenna Cussen about South Bend’s Chicory Cafe for the Snow Ghost Community Podcast. You can listen to the complete podcast, or just read this transcription of the interview. Pie and Coffee: On our last Community Show, we were complaining that it’s hard to get Fair Trade coffee at a coffee shop in Worcester. In South Bend, though, it’s gotten a lot easier. Brenna Cussen: Great, thanks. How are you, Mike? P: Pretty good. Thanks for sitting through all this nonsense so that you could be on the show. Brenna: I’m happy, I’m very flattered that I got invited to be on the Bruce Russell show . . . Snow Ghost show. Bruce: If we’re going to do this, let’s get things right! P: So Brenna, I wanted to ask you about the Chicory Cafe in downtown South Bend. 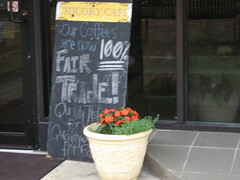 P: They have Fair Trade coffee! Brenna: They do! They made the transition slowly. Well, they had both options of Fair Trade and non-Fair Trade. And the Fair Trade was a little bit more expensive. I’d say maybe 15 cents more a cup. But just the other day, they made the complete switchover. And now they only serve Fair Trade coffee. 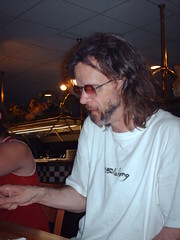 Bruce recently held a record release party for the new Snow Ghost album at the Pizza Hut in Worcester’s Webster Square. 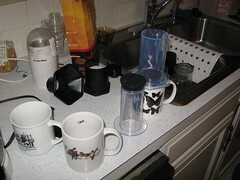 There was no beer, but people drank a fair amount of coffee. In this interview, we also complain about the local press and discuss mastery. Pie and Coffee: Courtyard Cafe. We’ve been talking about going there for a long, long time. Bruce: And we finally did it. P: And you feel a sense of accomplishment? P: —back when you used to run errands at Java Joe’s? B: Yeah. And I would go by there or, it goes back even farther than that. I have to back up a little bit. 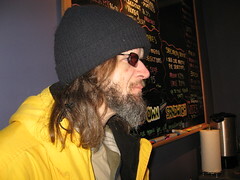 I used to go to Al Bum’s a lot, up on Highland Street, and I used to go by that coffee place a lot, the Courtyard. And I never found an apparition to go in there until . . . .